Independent Bookstore Day is just around the corner and Bookmans couldn’t be more excited. 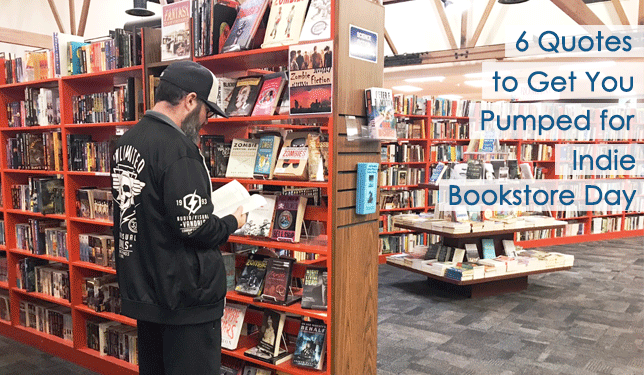 Bookmans stores across the state are gearing up for his annual event, planning awesome events and bookish fun for their communities. Customers can enjoy author meet & greets and kids bookish crafts to entertain. Plus, you’ll be able to score some Independent Bookstore Day exclusive merch on sale day of. The forthcoming Independent Bookstore Day blog will give you the full scoop on upcoming Indie Bookstore Day events. In the meantime, here are six bookstore quotes sure to give you the feels this Independent Bookstore Month! But are what are some of your favorite bookish quotes? What are some of your best bookstore experiences and what do you think makes a bookstore special? Tell us in the comments below and be sure to check out your local Bookmans for all the upcoming bookish fun we have planned. The indie bookstore fun never truly ends at Bookmans!